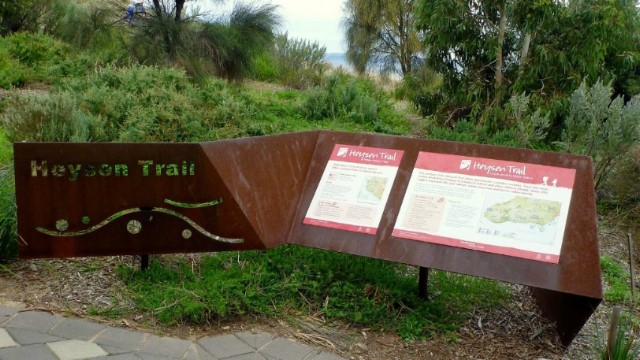 The 32nd Annual General Meeting of the Friends of the Heysen Trail and Other Walking Trails Inc. will be held at 7.30 pm on Friday March 22nd 2019. The venue will be the Woodville Lawn Bowling Club, Oval Avenue, Woodville. Nominations are sought from you, our members, for election to the Friends Council at the AGM, for positions including Vice President, Secretary, Treasurer and half the remaining members. Our Constitution calls for not less than four and no more than ten non office-bearing members. 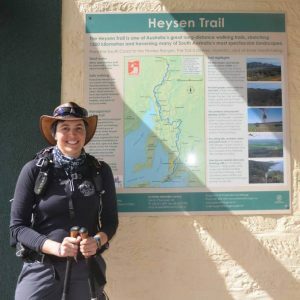 Our guest speaker will be Briony Ankor, who, in 2018 hiked the Heysen Trail solo using this challenge to raise funds and awareness of Narcolepsy. Hear about our Association’s activities in 2018 and plans for 2019. Meet your council (they are the people who make the decisions) and find out what we intend to do to further develop, maintain and promote the use of the Heysen and other walking trails. View further information about when Council meetings are held and the role of a Councilor. Download the Nomination Form for Council. Acceptance of Minutes of the previous AGM held on March 23rd 2018. South Rd & Ashwin Parade, Torrensville SA 5031, Australia. Nominations are sought from you, our members, for election to the Friends Council at the Annual General Meeting, for all positions including the Vice President, Secretary, Treasurer and half of the remaining members (our Constitution calls for not less than four and not more than ten non-office bearing members). Nomination forms available in Autumn Trailwalker and at the office. Council meetings are currently held on the third Wednesday of each month at 5.30pm, in a room adjacent to the Friends office in Epworth House, 33 Pirie Street. Meetings usually conclude by 7.30pm. In addition to Council, there is an opportunity for members to contribute to one of the various Committees: Walking, Trails Maintenance, Marketing and Membership (inc. Trailwalker), Office and Greening etc. 9.1 Setting of annual subscriptions. 9.3 Amendment to the Constitution. That in paragraph 7(3) and 16(3) “him” to “them” and in paragraph 8(6), 11(3), 14(3), 14(5) and in the Appendix to Constitution paragraphs 6(3), 8(3) and 8(5) “his” to “their”. That in paragraph 10 remove “his or”. NB this then negates the need to change Chairman to Chair as above. Guest Speaker Sean Benz Senior Ranger, Visitor Services. Sean joined the Department when the State Government’s $10.4 million investment in upgrading metropolitan national parks was announced. 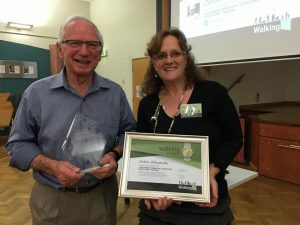 He has since been involved in those upgrades, including the new trails and camping areas at Onkaparinga Gorge National Park, the new playground at Morialta Conservation Park and the new trails at Anstey Hill Recreation Park and will talk of The Park of the Month initiative. Our new President, Melanie Sjoberg, walking the trail. At the Friends Annual General meeting last Friday, the Friends welcomed Melanie Sjoberg to the role of President. Melanie is a dedicated walker and in addition brings with her a wealth of organisational and negotiation skills. She recently retired from the position as Director in the Office for the Public Sector SA Govt. Melanie completed walking the Heysen Trail in August 2014 with our E2E 4 group. 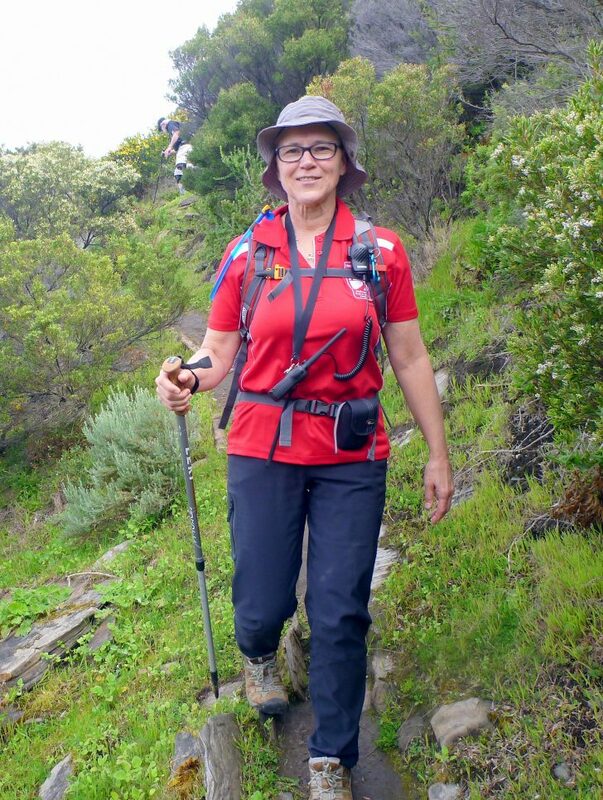 Since then she has continued her connection with the Friends by joining the Lavender Federation Trail walks. If you wish to pass on any comments or ideas to Melanie, you can do so by sending her an email at the Friends office, heysentrail@heysentrail.asn.au. Melanie has taken the reins from our Past President (and now Vice President) Robert Alcock. Robert also spoke at the AGM about the many memories he has of the friendship he developed and the many walks undertaken during his 6 year term. Robert’s contribution was heartily acknowledged by those in attendance. So thank you Robert and congratulations Melanie – welcome to the position of President of the Friends of the Heysen Trail and other Walking Trails. Ron Kandelaars – Ambassador to the Heysen Trail and guest speaker at the AGM. Come to the Friends’ AGM which is to be held this Friday, March 24 2017 at 7.30 pm. The venue returns to the Woodville Lawn Bowling Club, Oval Avenue, Woodville South (not to be confused with the 10-pin bowling centre on Port Rd). Guest speaker, Ron Kandelaars, the Friend’s Ambassador will address the meeting at the conclusion of the AGM. Ron will talk about his links with the Heysen Trail through the media. Ron is currently seen on Channel 7 and heard on ABC Radio Adelaide. 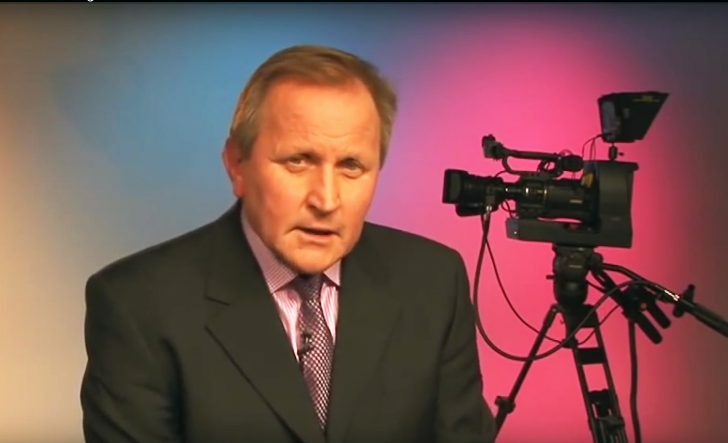 He is best known as the writer/producer/presenter (with Keith Conlon) of Channel 9’s popular long running travel program. ‘Postcards’. Hear about our Association’s activities in 2016 and the plans for 2017. Meet your council (they are the people who make the decisions) and find out their plans to further develop and promote the Heysen and other Walking Trails. The Friends of the Heysen Trail are saddened by the passing of our highly esteemed past President Jamie Shephard on 27 December, 2016. 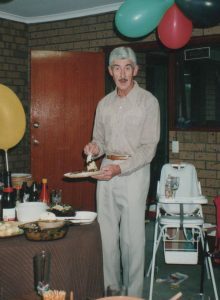 Jamie was active in all facets of the walking community, and a most generous host of social functions for the members. 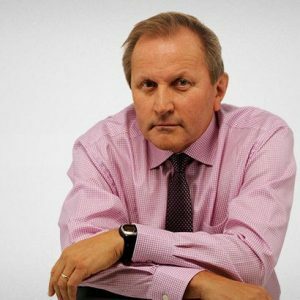 Jamie will be remembered as a true gentleman and friend to all who knew him, and he will be very sadly missed in the wider community. 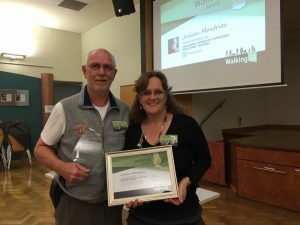 The Friends won an award on Thursday night at the Walking SA Awards for South Australia, for our work on the HeysenTrail and for our End-to-End walking program. Two of our members also won Walking SA Awards for Longstanding Contribution – Individual. Colin and Julian were awarded for an enormous amount of work they have put in over many many years. Friends of the Heysen Trail ambassador, Ron Kandelaars, was interviewed today by Ian Henshke on 891 ABC Adelaide. 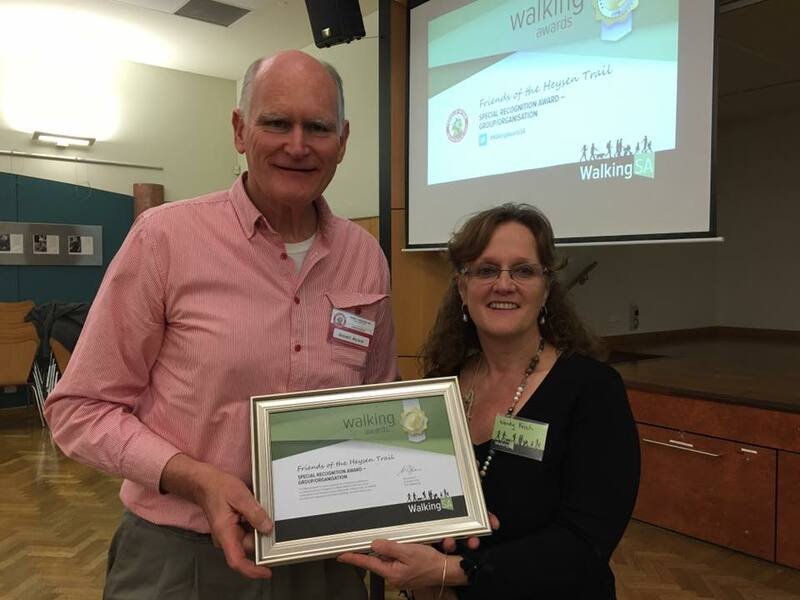 He discusses walking South Australia’s 1200 kilometre long Heysen Trail as a great bucket list item, and our organisation’s End-to-End Walking Program. He also interviews Katrina Gillespie who is walking the trail with her two teenage sons and husband together, to set aside their digital devices and walk the Heysen Trail together as a shared experience. Much of the Heysen Trail infrastructure is now 30 years old. Trail remarking and track work – a 3 year project commenced this year. Camp site facilities – toilets, water tanks and benches are planned for more sites. Hut upgrades to include benches, seats, painting etc. New huts are being considered at White Park; Simmons Hill; Cuddlee Creek and a Freemans hut replacement. Rebuilding the Waitpinga Beach sand ladder. We need help to get these projects moving, both in the field and at our Cobbler Creek shed. Waitpinga Beach walkway: We need a team to urgently undertake work on the sand ladder. The existing structure is in a dilapidated condition. Cobbler Creek shed, Salisbury East. Urgent work is required to produce items needed for the campsites and huts. We propose to initially open the shed once a month, on a Tuesday from 9 am to 3 pm, for this work. We would love to hear from anyone with time available and an interest in the trail to HELP us. Contact us to discuss how you can help. The trail needs us, please help. We welcome Ron Kandelaars as our new Friends of the Heysen Trail Ambassador. At the recent Walk for the Heysen event President Robert welcomed Ron into the role, and presented him with an Ambassador certificate. We all welcome Ron into the Friends family. Public relations consultant for a variety of corporate and government clients working on both South Australian and national issues.